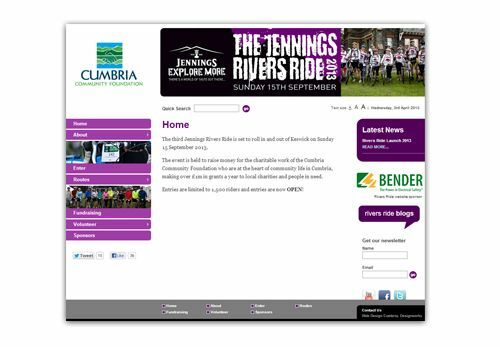 We worked with the Cumbria Community Foundation to create a website for the Jennings Rivers Ride. The new site includes an on-line application form and payment facility. The cycle challenge is held to raise money for the charitable work of the Cumbria Community Foundation who are at the heart of community life in Cumbria, making over £1m in grants a year to local charities and people in need. Entries are limited to 1,500 riders and entries are now OPEN! Go to the Jennings Rivers Ride site and sign up.